What is Hootsuite and Why is it Useful? We all know how time consuming tweeting and posting can be, however Hootsuite is designed to make all of our lives much simpler. Hootsuite is a way for us to monitor our social network sites. It was founded in 2008 when developers wanted to ‘create a better social media experience’. It allows us to check our analytic status, view how well our posts are doing and it allows us to schedule future posts for Twitter, Google Plus, Facebook and LinkedIn. 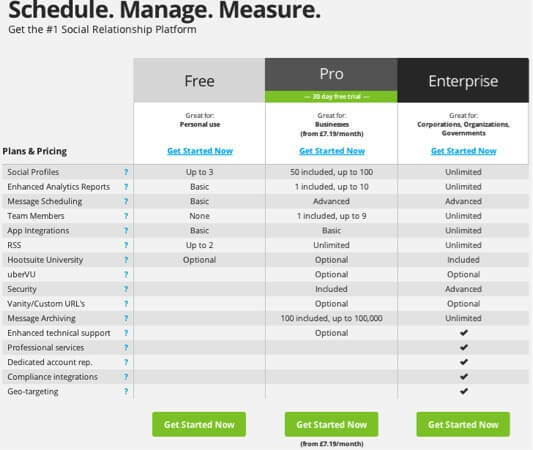 When you sign up, Hootsuite will give you three options. The Free package is mainly for personal use as it has the basic features and only allows up to three social profiles. The Pro Package allows users to have up to 100 social profiles and contains five more features than the basic, this is more suitable for businesses. The Enterprise Package contains all of the features as well as unlimited amount of social profiles, these would be more suitable for a big organisation. You will then need to add your social accounts. You can rename these tabs so you can easily find what you’re looking for. 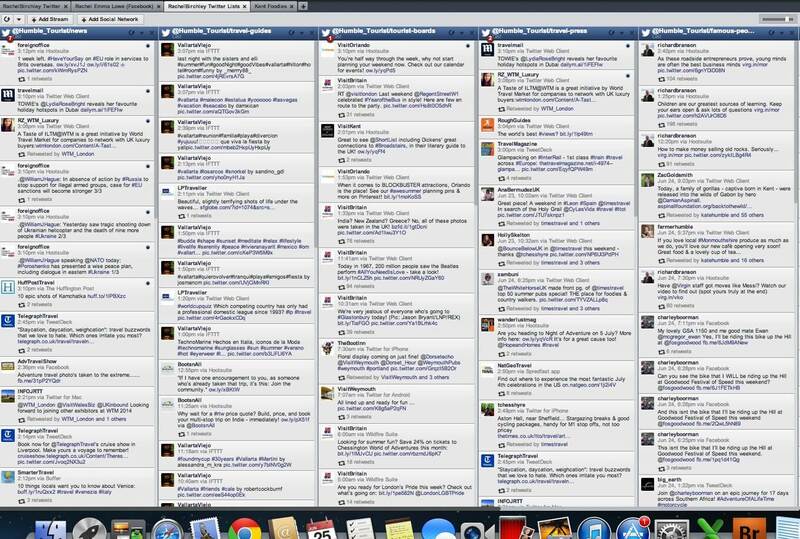 Once you have done this your news feed, posts and direct messages will all show up together so you can keep on track. Within these sections you can create categories for different needs. For example you can create a stream for your Twitter lists. You don’t have to follow people on Twitter to add them to a list. This lets you keep track of their news feed. Users will be notified when they’re adding to your list so take care with how you name it! 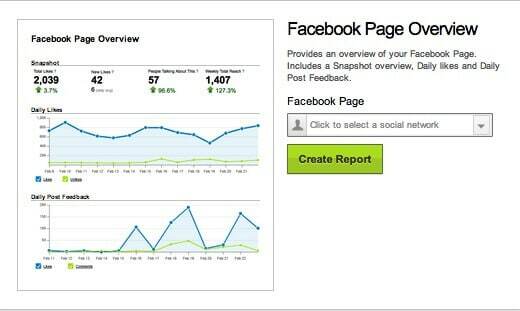 The Analytics is a report showing the statistics of your social profile each month. It shows the total of likes received in that month, how many people are talking about it and the weekly amount of people reached. Scheduling Posts can be quite simple to use. Firstly, you start off by clicking on the ‘Publisher’ icon. Once you’re on the page you choose the social profile you would like to schedule for. Then at the top of this page you will find this text box. This is where you will write your post you wish to publish and schedule when you would like it to publish. You can choose the date and time by clicking on the small calendar in the bottom right corner. If you want to, you could ‘autoschedule’ the post, which lets Hootsuite decide when to post based on when it thinks it’ll reach the most people, or click ‘send now’. On the left, you will need to select what social profile you would like to post for. You can highlight both Facebook and Google+ as they both perform in a similar way, however Twitter performs differently and can only have a certain amount of characters. So when you highlight Twitter make sure it is highlighted on it’s own. One clever thing about Hootsuite is when you highlight Twitter it will come up with a character limit as the bottom of the publishing box so you are aware of how much to write. This publishing tool allows you to attach a link which can come up as a thumbnail. Also you can add the location, as well as several attachments. You can edit these posts by hovering the mouse on the far right of the post. You can reschedule the post, edit the details or delete the post entirely. Once the post sends it will be removed from the screen. So is Hootsuite worth signing up to? Hootsuite helps in every way and will make life a lot simpler. You can manage anything from personal accounts to company accounts, pages, groups etc. It’s fairly simple to use and it could benefit you in the long run. The only downside we’ve come across is that images attached to tweets only come up as owl.ly links rather than as pictures on Twitter. Have you signed up to Hootsuite? Or do you use a different social tool? If so, how does it compare? Let us know in the comments below.